★ MOVEMENT MONITOR (STEPS, DISTANCE, CALORIES): Recording all day activity and calculating the walking distance as well as calories energy consumption. 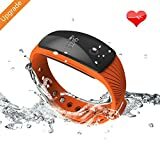 You can also set a goal according to your personal planning, enabling the bracelet to remind you to complete the daily mission, keeping healthy life, then we are sure that you may fall in love with sports and beautiful yourself gradually. ★ SLEEPING TRACKER: Skin-friendly texture together with light weight design, accompanying you sleep, keeping track of sleep duration and quality, analysising the results of deep sleep, shallow sleep, presenting latent trend through the App data, which helps improve sleep level and realize you a restful sweet sleep. ★OUTSTANDING AFTER SALES: We offer an 30-day money-back guarantee, if the product has any quality defect. Any problem, we offer 24-hour reply via email ryan@riversong.com.cn. If you face a problem caused by incompatibility. We suggest to delete APP and re-connection Bluetooth setting in phone then install APP again to solve the problem. 2.App synchronous interface: Analysis all kinds of health data which makes sure easier operation. When opening the App, it will show you the latest and history recording data, providing health advice, you can also share data to WeChat or QQ,, comparing to friends who lives in a more healthy life. 3.Time and date display：Accurately display the time and date as a sincere partner, which help you arrange your valuable time at will. 4.Alarm function：Wake you up at every lazy morning and start happy working full of vitality. 5.0.49 inch OLED Screen: Adopting advanced 0.49 inch OLED touch screen, presenting all kinds of data clearly and saving a lot of electric, making sure longer standby time. 6.TPE material strap provides more comfortable wearing experience. 7. Bluetooth 4.0 LE Version, faster and more stable data transmission. Strap Range：Maximum length is 7.6 inch, minimum length is 5.5 inch. App Installation:For phone users, please search “H Band” in App Store/ Google Play Store or other app download center then download the app.